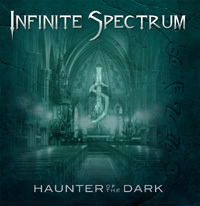 Review: "Infinite Spectrum: Haunter of the Dark" - Sea of Tranquility - The Web Destination for Progressive Music! Though the digital version of Haunter of the Dark has been available since mid 2016, the band Infinite Spectrum have recently signed with the acclaimed Lasers Edge progressive metal imprint Sensory and now here in early 2017 this excellent concept album finally sees the light of day on CD. Haunter of the Dark is based on an H.P. Lovecraft story, and those following prog and heavy metal over the years have obviously seen Lovecraft's work being referenced on numerous occasions to varying levels of success. For the New York bands second album, they've created dark, dramatic, and powerful arrangements here to go along with the story of writer Robert Blake's fascination with a mysterious Providence, Rhode Island church and all the occult evil that appears to be emanating from it. Vocalist Will Severin does an amazing job of telling this story, his vocals a mix of theatrical 'Peter Gabriel-ish' tones as well as more commanding heavy metal styled passages, providing for all the different moods needed to go along with the ever shifting storyline and musical arrangments. Katie Pachnos' symphonic keyboards play off very well against the muscular guitar work of Alex Raykin, the two providing powerful riffs together on the energetic "The Calling" (Dream Theater meets Deep Purple). Of course, much will be made of the epic "The Church", a 5 part 18-minute journey into dark, ominous prog, Severin deliciously setting the tone for a miasma of musical textures that recall Genesis, IQ, and vintage Marillion, featuring plenty of great keyboard and guitar solos as well as classy rhythms courtesy of bassist Alex Repetti & drummer Greg Schwab. Some of the albums heavier moments come in the snarling title track, highlighted by huge riffs from Raykin and Severin's high pitched wailing, as well as the complex, tumultuous "Fear", the band channeling Dream Theater at their most dramatic, complete with catchy vocal harmonies to go along with the crushing arrangements. Overall, not a weak track to be found here, the band offering plenty of variety from start to finish, keeping the listener completely on their toes with a never ending fluctuation of moods, tones, and colors, of which "2:12 AM" is a perfect example, as lush instrumentation and vocals calmly soothe before the bombastic interplay and soaring vocals shock the listener back into the finale. The production is stellar, the musicianship top notch, the vocals incredible, the melodies instantly memorable, and the storyline is quite intriguing. Your first must hear progressive metal concept album of 2017 has arrived!